The Supreme Court needs to settle birthright citizenship. 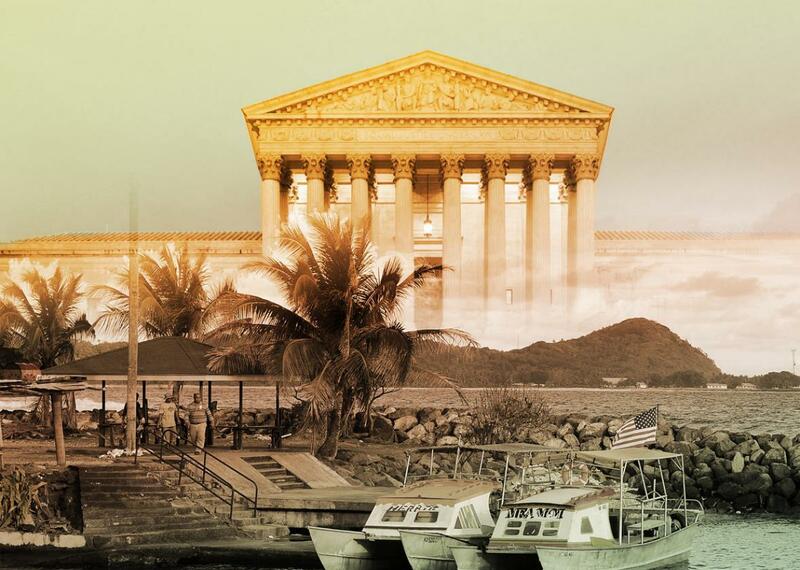 An injustice in American Samoa shows how SCOTUS can end this controversy. American Samoans are not granted citizenship at birth. Instead, they are considered “noncitizen nationals,” a legally dubious term that effectively renders them stateless. Photo illustration by Natalie Matthews-Ramo. Photos by Thinkstock and Torsten Blackwood/AFP/Getty Images. Soon, the Supreme Court will decide whether to take a case of astounding constitutional importance. Its outcome could alter the rules governing citizenship, equal protection, and the power of the federal government. And it centers around a tiny chain of islands that you probably cannot find on a map. The question: Can Congress decide that an entire group of Americans—born in America, raised in America, allegiant to America—does not deserve United States citizenship? American Samoans, the group in question, have been Americans since 1900, when the United States acquired their territory in the midst of an imperialist expansion. Since then, residents of America’s other territories have either achieved independence or gained U.S. citizenship. But in 2016, American Samoans stand alone: Unlike people born in, say, Puerto Rico or Guam, they are not granted citizenship at birth. Instead, they are considered “noncitizen nationals,” a legally dubious term that effectively renders them stateless, a mark of second-class status imprinted on their (American) passports. Is all of this constitutional? No, it is not. And that’s why a group of American Samoans are asking the Supreme Court to invalidate the status quo and extend citizenship to all those born in the territory. Their lawsuit arrives at a peculiar cultural moment, in the midst of an election that has thrown the definition of birthright citizenship into political (if not legal) controversy, with Republicans such as Donald Trump challenging its constitutional legitimacy. If the justices take the case, they’ll have the opportunity to definitely settle the matter of U.S. citizenship. If they do not, they’ll allow this unfortunate debate to rage on—and permit American Samoans to suffer citizenship discrimination indefinitely. Yet the court soon abridged the 14th Amendment’s grand guarantee of equal citizenship in two ways. First, in Plessy v. Ferguson, it allowed states to segregate their citizens on the basis of race. Second, it imported Plessy’s “separate but equal” rationale into the law controlling America’s newly acquired territories. In a series of decisions called the Insular Cases, the court segregated new territories into two categories: Those populated by “Anglo-Saxons,” and those populated by “alien races.” The Anglo-Saxon territories, the court held, were destined for statehood, and thus must be governed under the usual constitutional rules. The “unincorporated territories,” on the other hand—those populated by “alien races”—need only be granted the barest of constitutional rights. American Samoa was one of these territories. The Insular Cases were a very close cousin to Plessy, relying on a strikingly similar rationale of racial inferiority And yet unlike Plessy, the Insular Cases theoretically remain good law today. For that reason, the D.C. Circuit, in ruling on the American Samoan lawsuit, relied on the Insular Case’s “constricted understanding of the term … ‘fundamental right’ ” for those living in “unincorporated territories.” Accordingly, the appeals court found that birthright citizenship is not “so natural and intrinsic to the human condition” or “free and fair societies” that is rises to the level of a fundamental right in these instances. American Samoans’ citizenship request was denied. There is widespread academic consensus that the Supreme Court should overturn the Insular Cases outright. And if the justices hear the American Samoa case, they will have a plum opportunity to do so. But the truth is that this case can be decided without resort to the Insular Cases, both because the framers of the 14th Amendment were unequivocal about their intent to apply the birthright citizenship clause to territories and because the Insular Cases didn’t address that clause at all. Sen. Lyman Trumbull, who was heavily involved in the drafting of the post–Civil War amendments, stated that the clause “refers to persons everywhere, whether in the States or in the Territories or in the District of Columbia.” Sen. Reverdy Johnson, who was directly involved in the drafting of the Citizenship Clause, declared it referred to “fact of birth within the territory of the United States.” And the “initial blueprint” for the 14th Amendment, the Civil Rights Act of 1866, explicitly granted citizenship to people born “in every State and Territory” of the U.S. The 14th Amendment’s birthright citizenship clause was widely viewed as constitutionalizing this guarantee. If the Constitution’s text, structure, and history are so straightforward about territorial birthright citizenship, why are courts so hesitant to apply it? One reason: The government of American Samoa has largely resisted the effort to grant citizenship to the territory’s residents. They fear that, once American Samoans receive citizenship, courts might begin applying other constitutional guarantees more stringently. Specifically, they’re concerned that a fair application of the Equal Protection Clause to American Samoa would invalidate the territory’s racial land alienation laws, which prohibit the sale of certain communal lands to anyone with less than 50 percent Samoan ancestry. But it is not at all obvious why giving American Samoans citizenship would invariably lead to enforcement of other constitutional provisions like equal protection. The plaintiffs challenging the status quo aren’t asking the federal government to treat American Samoa like a full-fledged state; they’re merely requesting citizenship. And historically, the court has treated each territorial application of a constitutional clause as a discrete inquiry. The territorial government’s alarmism is thus deeply misplaced. The objections to birthright citizenship seem even weaker in light of the serious harms that noncitizenship routinely inflicts on American Samoans. Consider the plaintiffs bringing this lawsuit. One, a Vietnam veteran named Fanuatanu Mamea, was awarded two Purple Hearts after suffering severe disabilities from combat. (American Samoa boasts the highest rate of military enlistment of any U.S. state or territory.) Yet Mamea’s application to serve in the U.S. Special Forces was denied because he is a “noncitizen national” rather than a citizen. Another plaintiff, Taffy-lei Maene, moved from American Samoa to Seattle—where she was barred from voting, then fired from her job at a state agency because her passport declares that she is not a U.S. citizen. Two other plaintiffs served courageously in the Army but are still denied the right to vote. These are serious, concrete constitutional harms that affect real people on a daily basis. In a constitutional democracy, they are inexcusable. And worse, the federal government has suggested that it believes Congress has the authority to strip all 4 million territorial residents of their citizenship, including Puerto Ricans. The government’s assertion that it can inflict citizenship discrimination on an entire group of Americans subverts the heart of the 14th Amendment—at a time when far too many are already doubting its validity. America fought a war over the question of citizenship and the rights of those born in this country. A result of that war, the 14th Amendment clearly controls the outcome of this case. There is nothing new in the government’s feeble justification for depriving American Samoans citizenship—just old, racist arguments reframed in the modern language of the law. The Supreme Court should hear this case and grant American Samoans the citizenship rights guaranteed to them by the U.S. Constitution. Anything less would be a betrayal of the American constitutional project.